Atlantis has undocked from the International Space Station (ISS), as she prepares to target a landing on Friday. 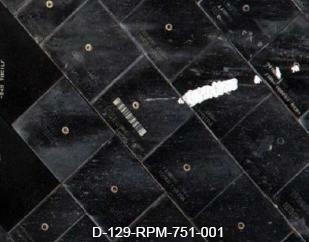 Late Inspections took place later on Flight Day 10, although this should only be a formality – following the Damage Assessment Team (DAT) formally clearing the orbiter for entry during her docked phase of STS-129. Atlantis’ undocking at 4:53am Central time was followed by a stunning one lap flyaround of the Station, allowing for photography to be taken of the exterior of the orbital outpost. Once the flyaround was completed, Atlantis performed separation burns to increase the distance between herself and the ISS. Late Inspections will be completed before the distance between Atlantis and the ISS are too great, allowing for the orbiter to return to the ISS in the event of serious damage being found during the final check of the Thermal Protection System (TPS). This procedure, utilizing the Laser Dynamic Range Imager (LDRI) and sensor suite package on the end of the Orbiter Boom Sensor System (OBSS), will be similar to Flight Day 2’s opening inspections – which provided a roadmap for engineers to compare data gained later today. This is required in case Atlantis suffered a MMOD (Micro-Meteoroid Orbital Debris) hit whilst docked. While serious damage is highly unlikely, due to the protection provided by the ISS when docked, orbiters can still be susceptible to hits, especially on their windows and radiators – as seen on previous missions. The critical area of the RCC (Reinforced Carbon Carbon) Wing Leading Edges (WLE) also have the ability to ‘feel’ impacts on their panels, via the WLE Impact Detection System (IDS). Presentations on the WLE IDS have noted no “triggers” of concern during the mission so far. The only areas of interest relate to blocked Waste Dump plumbing – which is not the cause of ice at the nozzle, per inspections. A couple of potential MMOD strikes may have also impacted one of the radiators – though this has yet to be confirmed at this time. Should that be the case, the lack of an issue with the freon loop cooling lines would suggest any damage would only be cosmetic. In all, there were only four areas of Atlantis’ TPS that gained mentioned in the TPS DAT summary – available for download on L2 – providing confidence Atlantis had suffered no notable damage during the powered ascent phase of her mission. Via the Orbiter Boom Sensor System (OBSS) inspection, the Orbital Maneuvering System (OMS) Pod digital camera survey by the Flight Crew, and the R-bar Pitch Maneuver (RPM), all areas of Atlantis were photographed per the pre-mission plan. All tile structure margins are within limits and the two External Tank umbilical well doors on Atlantis’ underbelly have been verified closed. The first area of TPS damage noted by the TPS DAT presentation relates to damage observed on Atlantis’ starboard chine. This damage area is insignificant, as reflected by the lack of comments from the DAT on this damage site. In fact, the DAT presentation only lists the location, dimension, and thickness of the damaged tile. The tile in question, tile V070-391034-477, has a “1.94 inch long x 0.9 inch wide” damage site. The tile’s overall thickness is 1.570 inches. No other comments were present on the DAT presentation, less the fact that the chine damage location was cleared for entry by P-DAT. The second TPS damage location is near one of the forward windows (Window #4). These damage locations were cleared by the DAT via equivalent area analyses and baselines. Third on the DAT list was the Port Inboard Elevon damage site. The area of damage is located on tile V070-193001-097 and is 5.18 inches long x 1.38 inches wide. 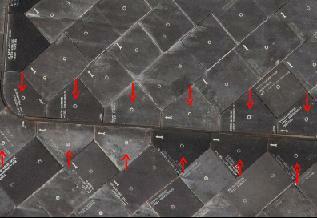 Based on the location site and size of the Port Elevon TPS damage, a parametric Thermal/Stress analysis was performed. “Results using bounding depth of 0.3 inches high margins maintained on TPS and Structure,” notes the DAT. The results of the analysis show that the maximum structural temperature the area of Atlantis’ skin under this damage site will experience during reentry will be 178 degrees F –well within the structural margins of the Orbiter. 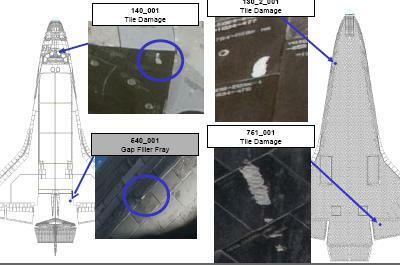 The final area of TPS damage noted by the DAT was a frayed gap filler on the Starboard OMS Pod. As such, all four TPS damage locations have been unanimously cleared for reentry. Since the STS-114 Return To Flight mission, part of the photographic purpose of the R-bar Pitch Maneuver (RPM) has been to obtain evidence that both External Tank (ET) umbilical doors have closed properly to form a protective thermal seal over the fuel line umbilicals. While both ET doors have been verified closed on Atlantis, the normal photographic evidence for the closure of the starboard ET door was not obtained during the RPM Wednesday morning due to poor lighting conditions. All ET door motor run times and latch indications were nominal and some 400mm photography of the starboard ET door had acceptable lighting conditions. 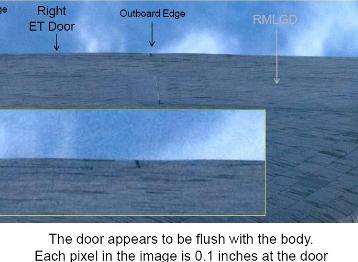 Further evidence indicating the proper closure of the Starboard ET door is the fact that “oblique RPM photos identified no visible step across door interface,” notes a Starboard ET door DAT presentation – available for download on L2. “3-D Photogrammetry tools (were) used to bolster confidence” that the ET door is actually closed. These measurements, which were generated by using the waterproofing hole marks across the ET Door/Orbiter underbelly interface, show a maximum door offset of only 0.11 inches, +/- 0.04 inches. “The high contrast waterproofing marks were used as tie points between images, and tiles were used as effective scale bars. Seven points were measured around the perimeter of the door and fit to a plane to define the local vertical axis,” notes the ET door presentation. This step measurement is well within limits. Thus, the DAT considers the Starboard ET door closed for entry. There were no dissenting opinions to this conclusion.